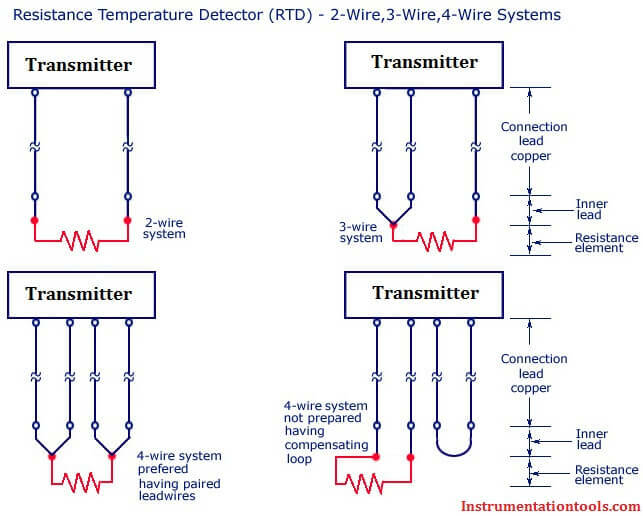 RTDs (Resistance Temperature Detectors) are offered with 2, 3, or 4 lead configuration. The best configuration for a specific application depends on a number of factors, however the sensor configuration must match with Transmitter, otherwise leadwire resistance cancellation circuitry may be ineffective. 2-lead constructions result in leadwire resistance getting added to the element resistance. Consequently, the temperature reading is artificially high. 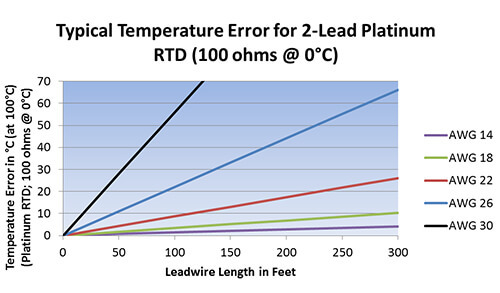 The graph below shows the temperature error, from 2 leads of various sizes and lengths, for a 100-ohm platinum RTD at 100°C. 2-wire construction is the least accurate of the 3 types since there is no way of eliminating the lead wire resistance from the sensor measurement. 2-wire RTD’s are mostly used with short lead wires or where close accuracy is not required. 3-lead constructions result in canceled leadwire resistance error only if the transmitter can measure true 3-wire resistance. Leadwire resistance error cancelation is most effective when all the lead wires have the same resistance. Using 3 wires of the same AWG, length, and composition will typically result in leadwire resistances matched within 5%. 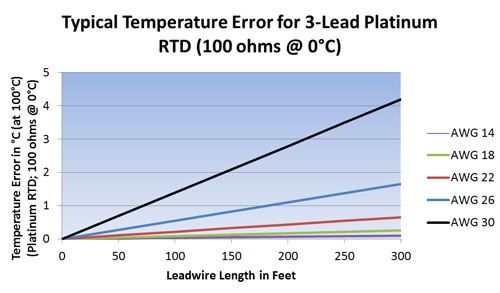 The graph below shows the temperature error from leadwire of various sizes and lengths, for a 3-lead 100-ohm platinum RTD at 100°C. 4-lead constructions result in canceled resistance only if the transmitter can measure true 4-wire resistance. True 4-wire resistance measurement will effectively cancel leadwire resistance error even if all 4 wires are not the same AWG, length, and/or composition. 4-wire construction is used primarily in the laboratory where close accuracy is required. In a 4 wire RTD the actual resistance of the lead wires can be determined and removed from the sensor measurement. The 4-wire circuit is a true 4-wire bridge, which works by using wires 1 & 4 to power the circuit and wires 2 & 3 to read. This true bridge method will compensate for any differences in lead wire resistances. How a 4 Wire RTD Works ? How 3 Wire RTD Lead Wire Resistance Eliminated ? What is RTD Accuracy ? What is a Three-wire RTD ?